My sister-in-law, Tiffany, called yesterday. “Do you guys want to have lunch at the new Thai place?” she asked. We did. Kris and I are eager to find another cheap restauarant close by. We picked up Tiff and drove to the Thai place, but it wasn't open. Instead, we walked over to Sully's, a small diner nearby. The place was full. “It'll be ten or fifteen minutes,” the hostess told us. We didn't want to wait. We climbed back in the car and drove ten minutes down the highway through heavy traffic. “We could eat at The Bomber,” I said, pointing out a local landmark. After World War II, Art Lacey bought a B-17, flew it to Portland, stood it on pillars, and built a gas station underneath it. He opened a restaurant next door. “You don't even like The Bomber,” Kris pointed out. “Every time we eat there you complain about how bad the food is. Let's go to Hale's.” But when we got to Hale's we were dismayed to discover a line out the door. “Not good enough to wait in line for,” said Kris. After some discussion, we drove to The Bomber. 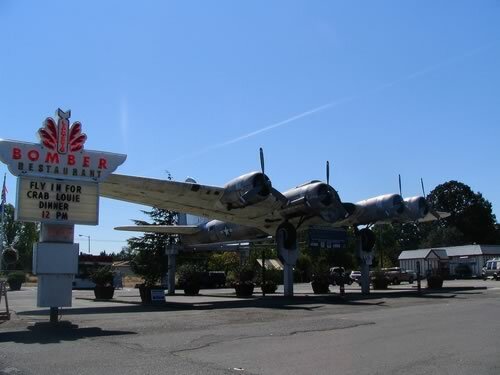 The Bomber is an Oregon landmark. Photo by vj_pdx. The Bomber's menu is a mess, with a layout so busy it's impossible to tell what's what. It's also full of cutesy names for common food. (The on-line menu is much clearer than the printed version.) Kris ordered a “Lacey Lady”, which most places would just call a turkey club. I ordered The Dunkirk — a French dip. No contest. I'd rather have one nice dinner out. I'd be willing to give up many similar restaurant meals for a single excellent dinner. Better still, I would rather have the lunch special at the local Chinese place. We could have eaten there for $5 each (including tip) and had enough left over for another meal! In all, we had a frustrating experience. We'd intended to have cheap meal at the new Thai place at 11:30. Instead we drove up-and-down the highway, didn't eat until 12:45, and paid too much for lousy food. A bargain is only a bargain if you get good value from it. There are 20 reader responses to "Sometimes a Cheap Meal is Expensive". One cannot be completely rational at all times. The fact that you all were probably hungry and around so much food could be the reason you decided to eat at The Bomber after all, in spite of bad previous experiences. it’s totally true. a cheap meal is expensive when you think of the real conseqences behind it. when i was working as a starving americorps volunteer who received a very very modest stipend (think $3/hour at 50 hours per week and the rent is $350, and this was in 2003) and worked an additional waitressing job to help paying the bills, i lived in poverty. and when i went to grocery store, choices were simple. whatever was the cheapest won. hmmm 50-cent crappy lettuce or 2-dollar nicer lettuce? 50-cent crappy lettuce with black holes and interesting things on it…. i also ate fast food across the street from my office almost every day. it was dirt cheap and quick. $3 for giant fried chicken wings, cole slaw, soda AND potato? awesome! i started to feel heavy 1 week into that diet, started to huff and puff every time i had to walk up the stairs. all those money that i “saved” by eating poorly, i paid it with unhealthy weight-gain and self-confidence. i am all for homemade lunches now! JD – You should have headed for downtown Milwaukie and stopped at Mike’s Drive In or Pietro’s dude. I can’t believe you actually went to the bomber! What Marc said. Or head North to Sellwood. Lots of great places here, and some of them are surprisingly cheap or… wait a sec… no Chang’s Mongolian Grill? Wow, lots of Portlanders here.. I’ve never even heard of The Bomber, but apparently I don’t really need to try it out. Enter your address and you can get a list of places, by category, and their distance from you. The Bomber? The Bomber? Arghhhhh. Where is this new Thai place? I did see a new Thai place called the Thai Frog behind The Ranch Tavern, but I don’t think that is the one you are talking about? It seems to me that the real moral of the story is to have patience. In trying to avoid a 10-minute wait, you burned up over an hour, had a bad meal, and may have also paid more than if you’d just waited at the Thai restaurant. It wasn’t the “cheap lunch” that was expensive. Another Portlander here. I’ve lived in the Portland Metro area (west side) for almost 20 years and I’ve never even heard of The Bomber restuarant. Seems that I haven’t missed anything, though. There are so many good places to eat here that it’s surprising that a place like that can survive – but it’s probably the airplane gimmick that keeps it going. I used to work in a restaurant. My mother, father, and step-father were all chefs. And my other father owns a small Thai food deli. So I really like good food. I would rather eat-out once a year at a nice place than every day at cheap places. unfortunately, my wife is the opposite and likes really bad food. I can’t even make “good food” at home because no one will eat it. My wife and I eat vegetarian style (it’s not a religion, but a dietary choice suitable for occasional breakage) at regular restaurants. That means we are usually eating the least expensive items (French fries, side salad, soup, etc) on the menu simply to stave off hunger until we can get home to some REAL food. At home, we can eat like royalty for less than $1.00 per meal. Think not? Whip up the Mushroom and Barley soup from the recipe found at http://harvesteating.com and serve with a dark bread and soft beverage. In Detroit, the ingredients cost about $2.00 and will make about 6 servings. Beverage, bread and fresh fruit completes the picture. Good for your health, too. If you like wine or beer, a robust glass of it with your meal would only double the price … still a bargain. The slow-cooker is your friend. I almost always have something simmering in mine. Something cheap, nutritious, filling and tasty. My wife and I may eat while we are out … but we almost never leave the house just for the sake of eating at a restaurant. Another thought that works for us is to entertain ‘home style’ rather than meeting friends at restaurants. The food is better at our place, the waitress is in no hurry to clear the table, the guy in the booth behind doesn’t want to discuss the fungus on his toenail and the women at the table 3 feet away aren’t asking for an ashtray in their no-smoking seats. Plus, we end up with someone interesting to talk with and get to know better. In turn, we find that the friends tend to invite us to their homes, too. That gives my wife and I TWO nights out for about what we’d pay for a single meal for ourselves. 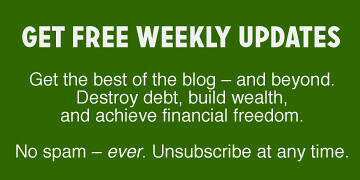 If you’re trying to live the frugal life, “restaurants = bad, home-cooking = good”. 2. Water for drink, not soda. wow! I live in portland too! Didn’t know the bomber was so bad. I haven’t been there since the movie Memphis Belle came out- we visited the bomber just because. I find that eating fish in Portland at a restaurant is often cheaper than buying the fish at the store, then the ingredients, and cooking it all yourself. You have to look on the bright side. So it cost you $20 to learn something, you learned you never have to go back there. Another possible moral. . .
Lots of nutritionists recommend that you carry a snack with you so you never get starving. It keeps you from unhealthy food binges. . . It usually does cost alot more to eat out, but sometimes it is worth it. Many places serve more than one person can eat in one meal. Look for places that will “split” the serving with two plates. Some do this for free, others will split a large sandwich on two plates with a full serving of chips or other sides for only a small extra charge. This way, you can have your cake and eat it too!